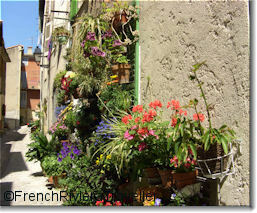 The hilltop village of Biot is truly a treat to visit and one of the best shopping destinations on the French Riviera. Yes it can be touristy but the narrow streets crammed with pastel houses, flowering plants and beautifully crafted objects make make for a delightful stroll. The ambience is reinforced by several excellent museums that celebrate Biot's rich artistic heritage. Perched on a hilltop only 4km from the coast, Biot has been a pottery centre for centuries . Before Tupperware and even before glass, people lugged around their wine and olives in clay jugs which Biot was expert in fashioning mainly because the surrounding terrain was rich in sand, quality clay and manganese. As other containers came into use, Biot artisans switched from the practical to the decorative and learned how to create extraordinarily beautiful jugs, jars and vases. 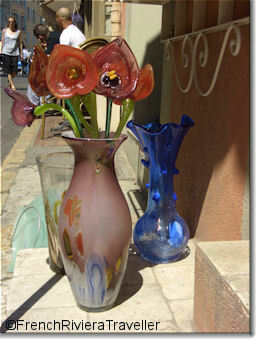 Glass-blowing replaced the manufacture of clay jugs and the skill reached a high level in Biot. By the 18th century, Biot was exporting its glass through the nearby port of Antibes. The town is now famous for producing glasswork with distinctive "bubbles" inside the glass that fetch a respectable price in the numerous small shops around town. Watch the glass-blowers at work by visiting La Verrerie de Biot, just outside town. It's open daily. Or, you can get a more precise perspective on Biot's artisanal tradition by visiting the Musée histoire et céramique Biotoises (closed Monday & Tuesday). Another highlight of Biot is the Fernand Léger Museum which contains some 350 works by the master. It's in grounds that Léger bought shortly before his death in 1955. And then there's the unusual Bonsai Arboretum which spans 3000 sq m all filled with the tiny plants. A8 motorway exit “Antibes Est"
The Biot train station is on the Nice-Cannes TER line but it lies on the coast, 4km from the town. See more about Cote d'Azur trains. Envibus handles bus services to Biot, connecting the town to the Antibes bus station, the Juan-les-Pins train station and the Biot train station. The Biot tourist office is at 46 rue St-Sébastien.